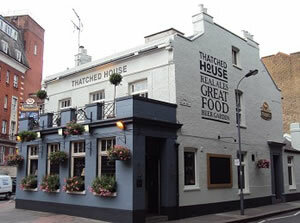 The Thatched House in Hammersmith is a 19th Century pub that was part of the local history of the area when King Street was the main route for the royal family on their way to Windsor, and Hammersmith was known for its aristocratic Roman Catholics, alms houses and convent schools. In the more recent history - in 2004 to be precise, Prince Edward visited the pub which is owned by one of the oldest English brewers - Young’s. The pub, one of my favourite locals for its great local buzz and historic importance, has often been the venue for hearty Sunday lunches watching sports with friends – cricket, tennis, rugby and Formula one. It’s a great place for kids and often our “street” parties are convened at the pub which has a dining area that can be booked for private parties. The beer garden in summer is particularly popular as it is tucked away from the main street and brings the best of the British country-side pubs to the heart of London. More recently the pub has gone gastro with a new manager Dennis Reus and head chef Jimi Gill. If you are a local and have enjoyed the great food at the Dartmouth Castle, you’ll know the style and panache that accompanies the menu planning and the delicate flavours that Jimi’s food is known for. We decided to meet at the Dalling Road pub one snow-bound evening and I had invited a friend from Kew to join me as she was just a bus ride away. As we had confirmed earlier in the day I got in a few minutes early and had a look at the menu and found it difficult to decide what to eat – the carpaccio of venison looked really good but I also wanted to tuck into a steak or the confit of duck leg. The Portobello mushroom salad with pancetta and a warm poached egg looked marginally more healthy as a starter and the fish and chips looked as tempting as the lamb burger and chips. I simply blamed the cold weather for being greedy even before we had started ordering. I then looked down the wine list, and of course on a cold winter’s day, red full bodied wines seemed the obvious choice. Toying between the chianti and the pinot noir was tough so I gave up the battle and asked our French waitress, Amadine what she would recommend. Wondering whether I should go ahead and order the pinot noir she suggested I started to get a little anxious – I didn’t want to eat this fabulous meal alone and my friend hadn’t turned up. I had also left my mobile phone at home thinking it would be great to have a quiet evening. But now I was a little worried, had the snow slowed down the local bus services or tube? I had just been on the District Line from town and there were (miraculously) no delays. Just as I was toying with the idea of walking home to pick up my mobile my friend arrived and after sharing the first glass of wine and chatter, I was pleased to see she was in as much of a dilemma as I was on the choice of food. After much debate, discussion and some dithering we decided we would both go for the steak as a main – one rare and one medium and on the starters I plumped for the salad and instantly thought I would regret it as she chose the venison. But I was delighted to be proved wrong, the salad was lovely, light and just right. I also got a taste of the venison which was superb and will definitely be my choice of starter on the next visit! The steaks did not disappoint and it may have been wise for us to have shared a starter as they were good steak portions with perfectly cooked chips. We did go through the mains rather slowly and as the wine slipped down so beautifully we decided to share the cheese platter and the wonderfully warm apple crumble over coffees. We had wanted it to be an early night so after two delightful hours (and the pub packed despite the inclement weather) we decided to get our snow boots on and wade home. The prices are sensible and so with the starter, main and the third course of cheese or dessert, a great bottle of wine and coffees you would expect to pay about £35-40 per head. The Thatched House -115 Dalling Road is open 7 days a week and on Christmas Day.